Here is a poster that I found while perusing an old issue of Jim Steranko’s MediaScene (issue 16 from 1975). 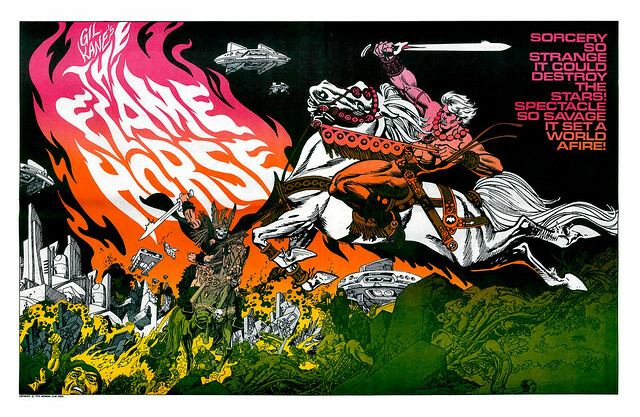 The Flame Horse, by Gil Kane. I had the idea that this was a new original work by Kane, who had previously published his independent creation, Blackmark. But I don’t think this ever appeared anywhere, unless Kane re-worked the material into something else. Let me know if you have more details. Meanwhile, the poster presents a glorious scene of Swords, Sorcery, and Science. What a cocktail that would have been! Nuff Said. I have never ever seen this piece before. Thank you for posting it.